Hike or ride the Mackletree Bridle Trail, which runs up Rocky Hollow and contemplate the life's work of Dr. E. Lucy Braun, the pioneering female naturalist who first comprehended the significance of Shawnee's "mixed mesophytic forest." The Mackletree Bridle Trail runs up Rocky Hollow and connects with Shawnee State Park’s CCC Overlook Trail. A long list of women naturalists have hiked Rocky Hollow and studied it as an example of the mixed mesophytic forest in Ohio. With the construction of Roosevelt Lake and Shawnee State Park in the 1930s, Rocky Hollow became easily accessible and popular with naturalists and, for decades, Dr. Braun led her students and other visitors up this hollow and around its ridges. Through her tours and publications, Dr. Lucy Braun raised awareness in scientific circles about the great biodiversity found in the hills of western Scioto and Eastern Adams counties, highlighting Shawnee Forest’s status as an endangered "mixed mesophytic forest." While the typical North American forest is dominated by two or three species, the mixed mesophytic can cradle up to eighty different woody species in its canopy and understory. Among them are beech, yellow poplar, basswood, sugar maple, chestnut, sweet buckeye, red oak, white oak, yellow locust, birch, black cherry, cucumber tree, white ash, red maple, sour gum, black walnut, and various kinds of hickory. "Yet the coherence of this forest region remains one of America's better kept secrets," notes a recent publication of the Library of Congress. Braun's work helped generate support for the protection of the region’s forest through the creation of the Shawnee Wilderness Area in 1972 and other area National Natural Landmarks in the Nature Conservancy's Edge of Appalachia Preserve System. 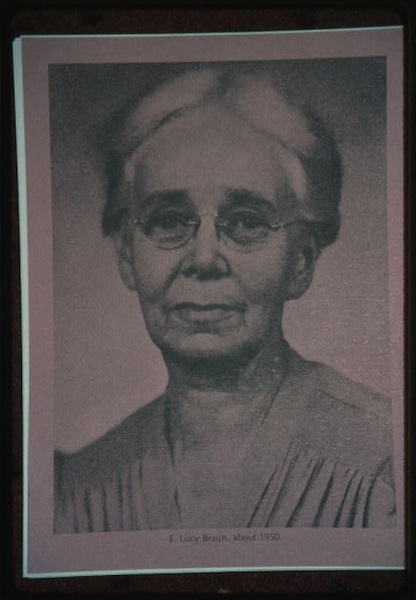 Braun, sometimes referred to as the "Lady Botanist," was a native of Cincinnati. She earned her Ph.D. from the University of Cincinnati and went onto serve her alma mater as professor of ecology. Her book, "The Deciduous Forests of Eastern North America," brought her international acclaim and she went on to become the first female president of the Ohio Academy of Science. Braun theorized that the mixed mesophytic forest's hollows "are the likely ancestral source of most temperate-zone forest species in the eastern United States" and thanks to her work, ecologists have begun to refer to it as the "mother forest." It was Braun who first championed a site within Shawnee Forest for protection and designation as a National Natural landmark. In 1970, at the age of 81, Braun accompanied National Park Service officials on a hike in Rocky Hollow, during which she argued for federal intervention in order to save the mixed mesophytic forest of Shawnee. Braun lamented the destruction of the Old Forest and called on Americans to save what remained: "Thoughtlessly and ruthlessly he destroys what only long ages can produce. With scarcely a thought for the future, he clears right and left. While a few of these remnants do still remain, let us make every effort to preserve them permanently that we and future generations may know of the great gift bestowed upon us." After Braun's death in 1971, interest in Rocky Hollow continued at the National Park Service. In September 1974, Rod Risner, Shawnee State Park naturalist, led Carol Stein, a biologist working on behalf of the National Park Service, up into Rocky Hollow. During her hike, Stein recorded the incredible variety of plants found here. “New York fern, beech fern, silvery glade fern, interrupted fern, lady fern, sensitive fern, Christmas fern, rattlesnake fern, maidenhair fern, and ebony spleenwort" grew in abundance. She noted the presence of "Disporum maculatum, a rare species in Ohio." And, among the other flowering plants, she recorded "wood-betony, crested dwarf iris, sweet white violet, coralroot orchid, woodland jack-in-the-pulpit, rattlesnake-plantain orchid, wild ginger, perfoliate bellwort, horse-balm, solomon’s plume, three-lobed violet, naked-flowered tick-trefoil, dodder, white snakeroot, and puttyroot orchid." Risner reported that earlier in the year "ladyslippers, showy orchid, and trilliums occur in numbers along the east ridge" of Rocky Hollow" and pointed out "earth-star fungi and fern moss on the slopes." At the ridgetop, Stein related “an abrupt change in vegetation from a mixed mesophytic association to an oak--blueberry association," which here includes "American dittany, rattlesnake-plantain orchid, coreopsis, coralroot orchid, and striped pipsissewa." Stein's official conclusions are worth considering: "In my opinion, Rocky Hollow meets national natural landmark criteria by being an ecological community significantly illustrating characteristics of the Unglaciated Appalachian Plateau physiographic province." However, before any designation be made within Shawnee Forest, Stein called for additional studies of the Shawnee Wilderness Area and Snake Hollow area as possible candidates. In 1982, building upon the work of Braun and Stein, Marshal A. Moser, a certified Wildlife Biologist working on behalf of the National Park Service, completed another study of Rocky Hollow. Moser concluded that Rocky Hollow could be cited as the basis for designating the whole Shawnee Forest and and The Nature Conservancy's 'Edge of Appalachia' preserves as a National Natural Landmark. “This region of south-central Ohio along the edge of the Appalachian plateau has sites of enough ecological and geological significance to merit another landmark designation. If possible a 'region-wide' designation ... should be investigated." "Within the troubled eastern deciduous forests, the crisis of the mixed mesophytic poses a special case," writes Mary Hufford. "If, as Braun argued, the central Appalachian coves sheltered biodiversity against the extreme cold that interrupted the evolution of surrounding forests, it follows that the same coves could again become banks of species diversity, sustaining heat-intolerant plants in a period of global warming." The work of Dr. E. Lucy Braun points to the critical role female scientists have played in the success of the modern Environmental movement and in the saving of Shawnee Forest. Braun bridged the original Conservation Movement of the Progressive Era with that of today's Environmental Movement. What lessons can we draw from the life & work of E. Lucy Braun? What impact might climate change have on the significance of Shawnee Forest? If the recommendations of Braun, Stein, and Moser have yet to be fully implemented and if the needed work of conservation & protection is yet to be completed, what sites in the Forest are in greatest need of rescue? George Laycock, “The Lady Botanist,” in The Richard and Lucile Durrell Edge of Appalachia Preserve System. Adams County, Ohio (Cincinnati: Cincinnati Museum Center, 2003). Marshal A. Moser, Jr., "Rocky Hollow, Scioto County, Ohio: An Evaluation of a Potential National Natural Landmark," Division of Natural Landmarks, US Department of the Interior (1982). Carol Stein, "Evaluation of Rocky Hollow, Shawnee State Forest, Ohio, as a National Natural Landmark" (1974). 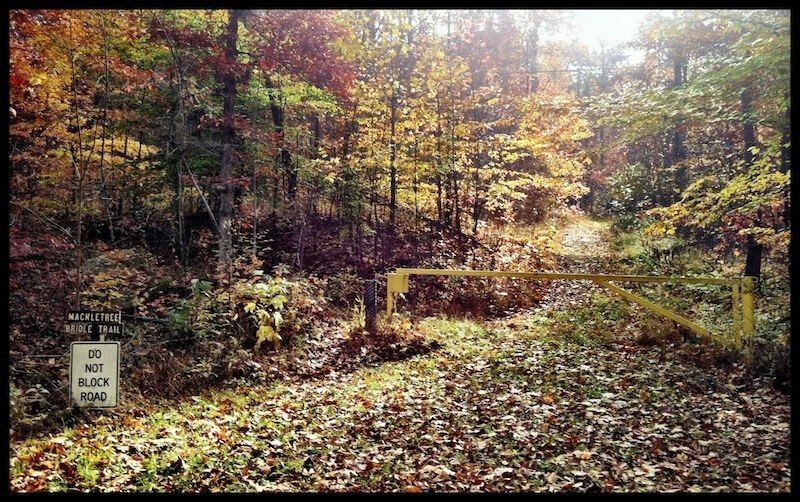 Entrance to Rocky Hollow and the Mackletree Bridle Trail: Image courtesy Andrew Lee Feight, Ph.D., from the Scioto Historical Series, private collection, Friendship, Ohio. 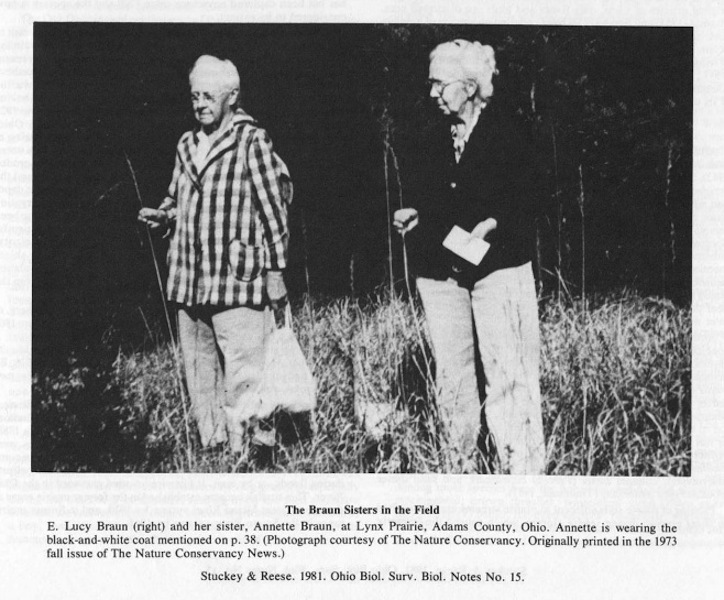 "E. Lucy Braun (right) and her sister, Annette Braun, at Lynx Prairie, Adams County, Ohio. ": Photograph courtesy of The Nature Conservancy. Originally printed in the 1973 fall issue of The Nature Conservancy News. Reprinted in Stucky & Reese, "Memories of E. Lucy Braun," Biological Notes, No. 15 (1981). Andrew Lee Feight, Ph.D., “Rocky Hollow & the Work of Dr. E. Lucy Braun,” Scioto Historical, accessed April 24, 2019, https://sciotohistorical.org/items/show/3.